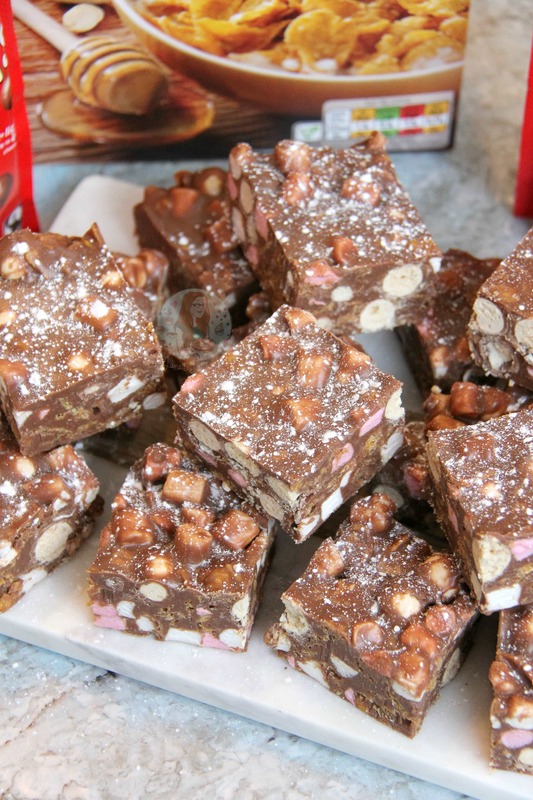 A delicious twist on a classic – Cornflake & Malteser Rocky Road! Perfect for a party, or just as a good snack! 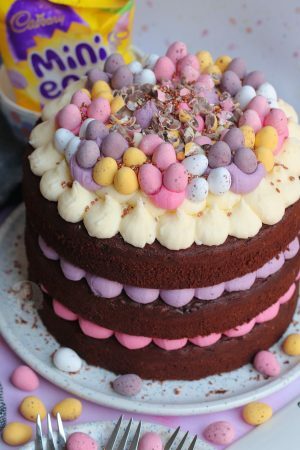 The mixture of Chocolate, Golden Syrup and Butter makes a dreamy chocolatey mix. It makes it softer compared to just melted Chocolate which I am not a massive fan of when it comes to Rocky Road. I prefer it to have these other ingredients in otherwise its just chocolate and its rock solid. Obviously, some people prefer this, but I have had such rave reviews of this recipe and my Rocky Road for example which also uses it, that I know a lot of you are on the same wave length as me! 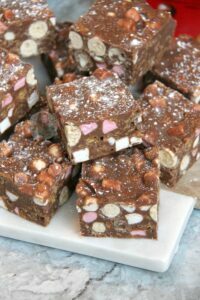 I like my pieces of Rocky Road nice and chunky (which you can undoubtedly tell from the pictures) and you might think OH MY GOD THEY’RE MASSIVE, but all my taste testers showed that even if you make the pieces smaller, you still go back for seconds! Sometimes I make this with just cornflakes in the middle (half the chocolate mixture too) and bung all the marshmallows on top – it makes a slightly lighter treat, but both are truly delicious! 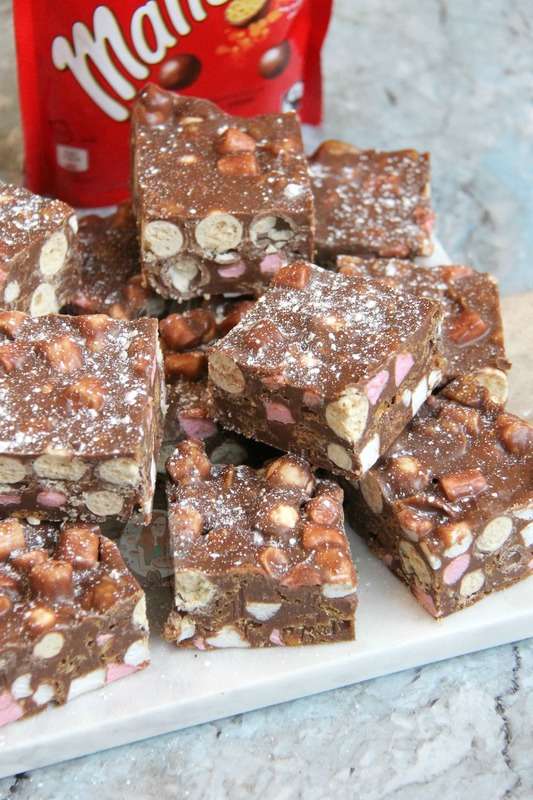 But honestly, if you like Maltesers you will LOVE this. I used Honey Crunch Cornflakes for this particular one, but you can use plain ones as well. I just have a habit of trying to buy something I am also going to eat after the recipe, and I don’t like plain cornflakes in any way shape or form. 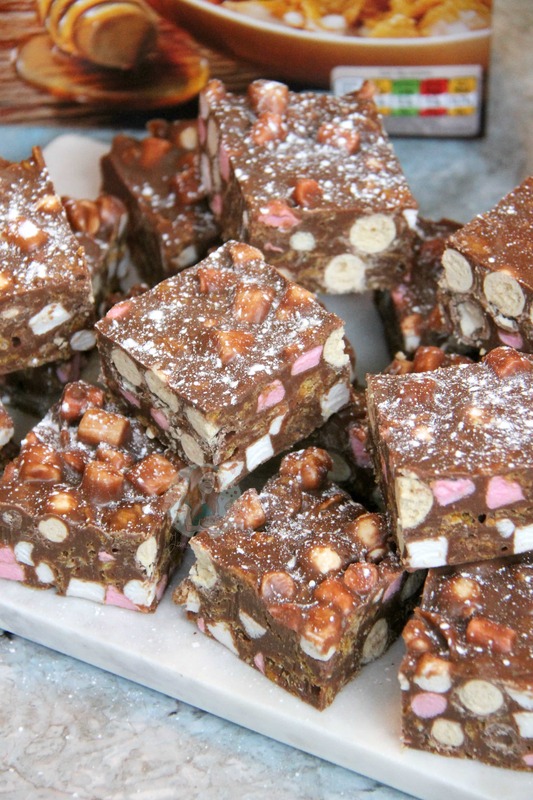 This recipe makes 16-25 large pieces of Rocky Road! 1) Line a 9×9″ square baking tray with parchment paper, leave to the side. 2) Melt the golden syrup and butter gently in a pan on a low heat – when the butter and syrup have melted fully and started to bubble slightly, turn the heat off and add the chopped chocolate and stir until the chocolate has melted – if it doesn’t quite melt then turn the heat back on to a very low setting so that the chocolate doesn’t split. 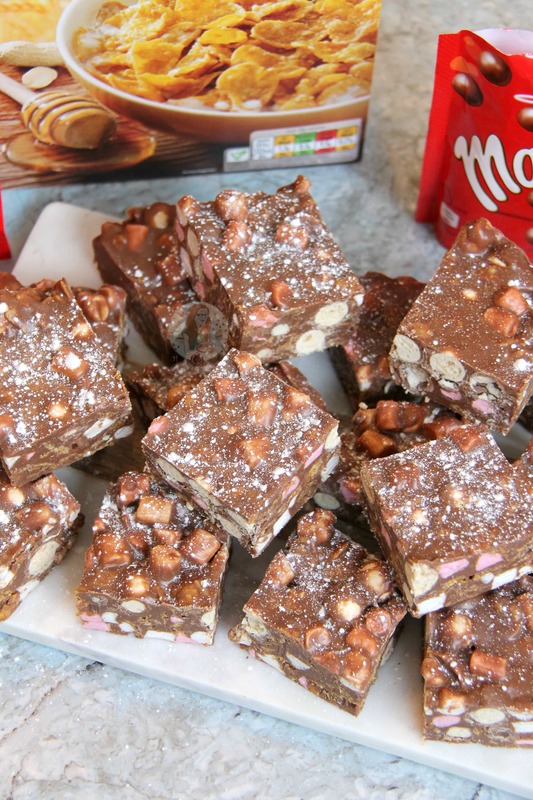 3) Pour the cornflakes, maltesers, and mini marshmallows into a large bowl and pour the chocolate/syrup mix on top. Mix the ingredients together thoroughly until its all coated well. Pour into the tin and press down very firmly. 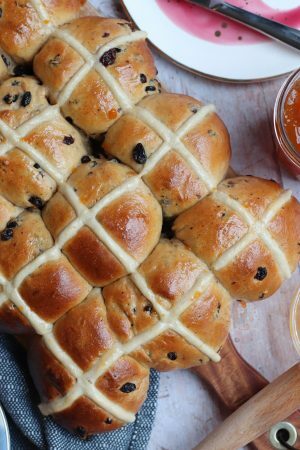 Leave to set in the fridge for 3-4 hours, or a bit longer if it still feels too soft. 4) Once set, carefully remove from the tin and cut into your pieces. I do 4×4 so I get 16 large pieces, or 5×5 for slightly smaller but still delicious sized pieces. Dust with Icing Sugar or give it an extra drizzle of chocolate for show. 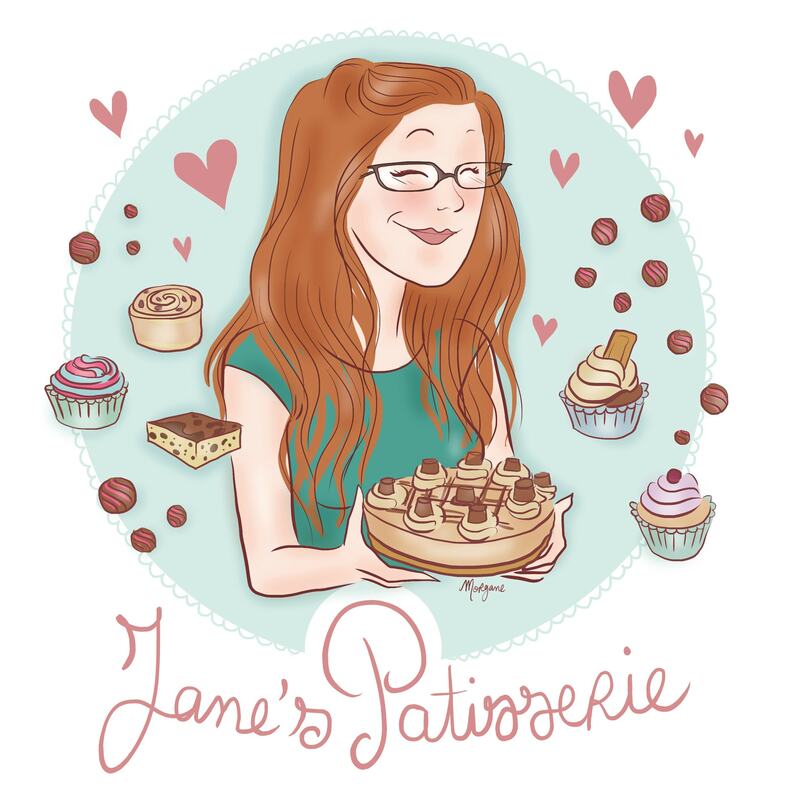 I often use either Callebaut Milk Chocolate or one from the supermarket own section – I find the flavour works best, but you can obviously use whatever you like. This recipe will work perfectly with Milk or Dark Chocolate, but not so much with White Chocolate. The mixture of White Chocolate with Golden Syrup, and Butter can quite often split because of the sugar content and lack of cocoa solids in White Chocolate. Look at my Oreo Rocky Road if you want to use White! This will last for 1-2 weeks in the fridge. 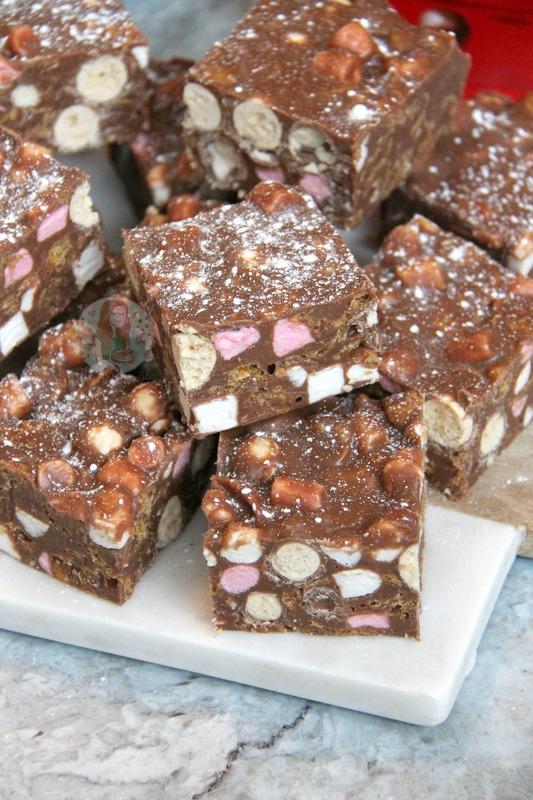 Find my other Traybake & Rocky Road Recipes on my Recipes Page! Older Next post: White Chocolate and Cranberry Scones! Newer Previous post: Terry’s Chocolate Orange Bundt Cake! Just made the rocky road this morning! 🙂 Already eaten 3 bits!!! Its so yummy. I added glace cherries as i had some in the cupboard to use up. Oh well isn’t that a shame 😉 haha please do!! Haha thank you so much, its so yummy!! 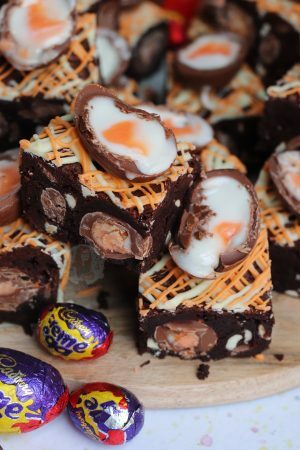 Oh my god, this looks amazing, I have to make it! I love to add glace cherries to mine too -yum! Ooh that sounds delicious! 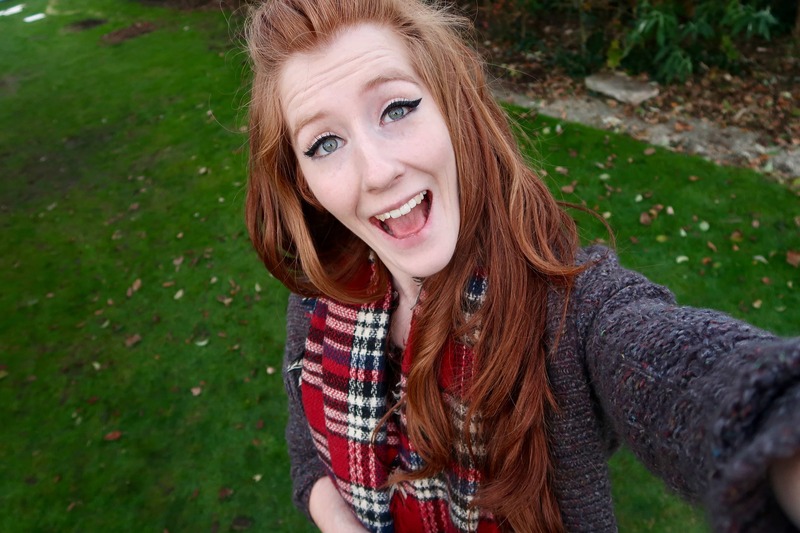 I shall definitely try that next time! Of course! That would be delicious!! 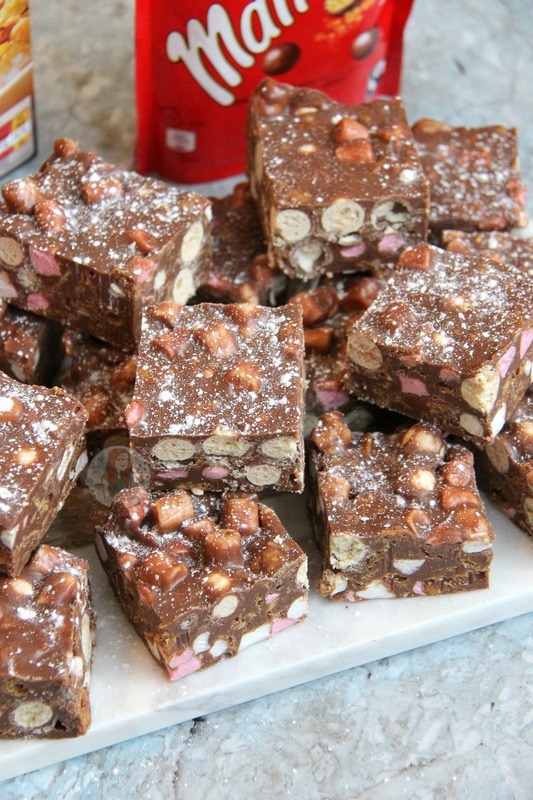 Just putting this here to remind me to make these divine looking beauties…and plus to share with my followers because who doesn’t like rocky road?! I can easily get through a whole bag of maltesers in one sitting, they’re so moreish! They reeeeally are aren’t they! So good!